Volunteering helps horses in transition and those who help them. Several times each month, Mary Lou Spellmeyer travels the hour to Longmeadow Rescue Ranch in time to bring horses in from their nighttime turnout and begin the morning feeding ritual. Spellmeyer became a volunteer at Longmeadow in 2010—about the same time she returned to the St. Louis, Missouri area. She didn’t have much experience with horses then, but she was willing to learn and eager to connect with the community. Spellmeyer is not alone. According to the U.S. Department of Labor Statistics, more than 62 million people volunteered for an organization between 2014 and 2015. More than 41 percent of those became involved with the organization of their own accord without being asked to help out. More specifically, the 2017 American Horse Council (AHC) survey revealed that 1.37 million people were involved in horse-related volunteer activities. And in 2018, the service of each volunteer was valued at $24.69 per hour, according to Independent Sector, a national membership organization of nonprofits, foundations and corporations. Statistics notwithstanding, volunteerism is critical to the success of most horse adoption organizations, says Jennifer Williams, Ph.D., executive director and founder of the Bluebonnet Equine Humane Society in College Station, Texas, and author of How To Start and Run A Rescue. Much of that work involves interacting with horses, according to Tawnee Preisner, president of the Horse Plus Humane Society. So horse-savvy volunteers at Horse Plus do everything from grooming to exercising. At Longmeadow, the animal shelter for the Humane Society of Missouri (HSMO), volunteers are called ranch assistants, and they do everything from feeding and watering to cleaning stalls and mowing grass, says Anne McLaughlin, HSMO communications coordinator. “They also provide our horses with positive human interaction and support a horse’s comfort and confidence around new people,” McLaughlin adds. But while most horse adoption organizations rely on volunteers to do all kinds of tasks, becoming a volunteer generally requires more than just showing up. In fact, most organizations require that volunteers undergo training programs and more. 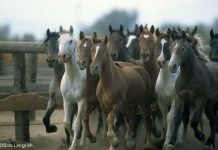 In addition, all volunteers are required to sign a release holding the organization harmless from liability, and each is given a copy of the organization’s rules, including no hand-feeding and putting a hand on a horse while walking around it. At most organizations, volunteers may sign up for specific duties or for consistent scheduling. But generally, volunteer scheduling is more fluid. What’s important is that prospective volunteers understand that most of their horse-related activities, from feeding to mending fences, requires hard work. Even so, volunteers need not be horse savvy to help out at most organizations. For instance, along with caring for the horses, Spellmeyer’s volunteer duties also include leading guided tours of the facility and lending a hand with children’s horse camp activities in the summer. Meanwhile, some of Bluebonnet’s volunteers perform administrative work, help plan fundraisers and other events, and manage the organization’s public relations and social media activities. Others check up on horses that have already been adopted or are residing in foster homes. Finally, its location near Nashville allows Horse Plus to benefit from a group of high-profile volunteers, some of whom are not experienced equestrians. Brought up around horses since her childhood, Christian initially visited Horse Plus last year as a prospective adopter after her own horse died at age 36. Since then, she has adopted a horse and fostered others. 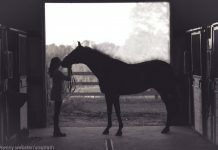 “When a horse goes on to be adopted, I can speak honestly when the adopters ask about his behavior or temperament,” she says of her experience fostering. Christian has also assisted in rescue operations and with a one-day clinic in California where some horses were euthanized due to age or injury at no cost to their owners. Ultimately, it’s not just the horses that are helped. “We have all sorts of folks who just want to come out and be with a horse,” says Finch. “Cops, school teachers, a judge, the occasional stranger that drives into the parking lot and stands at the fence petting a horse … people from high-tension positions that know the magic of unwinding by simply being in a horse’s presence. The few moments between a stranger and a horse is pure bliss for both.